After going through the screening process I am officially a member of Marcom Professional. As promised, I reviewed the site so those that aren’t members, or can’t become one since they’re not in the industry, can have glimpse at what’s underneath the hood. Below are screen shots that can be enlarged. The top screen shot is of Marcom’s home page (it’s from a printable version so the color scheme and spacing are a little off). The bottom screen shot is the members page. 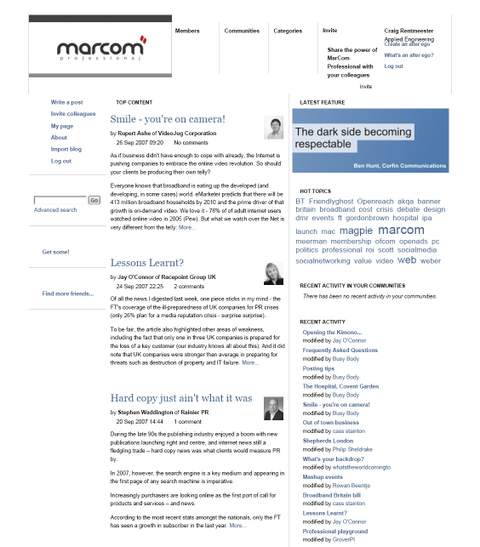 Marcom’s home page looks like a blog. In the sidebars of the page are a categories section, a hot topic section that functions similar to a technorati cloud, a recent activity (posts) section. In the center of the page is a list of recent blog posts contributed by various members. Communities – join together with other professionals to discuss topics. Have events in your area. This functions similarly to Facebook Groups. Members – Search and become friends with other members. I like the community feature. I think this is the only value that Marcom provides. Marcom encourages the use of aliases. I understand that aliases allow people to push the envelope in terms of the topics they write about, but I think industry professionals shouldn’t be afraid of backlash inside their own community. You can only import blog posts from Blogger and WordPress. Like any new social network, there aren’t many members nor content. C – This site is very mediocre. The design is simple and aesthetically pleasing. Other than that, there aren’t any unique features. 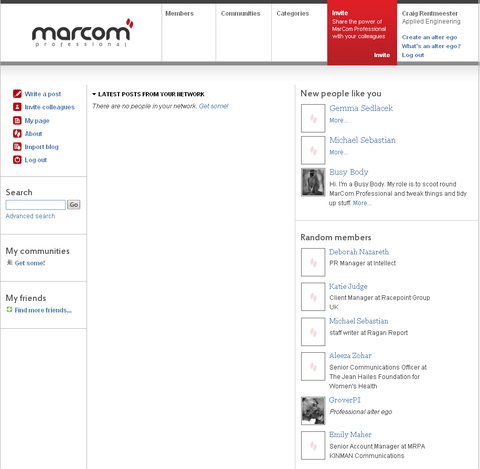 I would be surprised if Marcom takes off any time soon. For a site dedicated to, and probably built by, marketing professionals, it doesn’t offer very much of an experience. Even if I wanted to import my existing blog, there is no way to do it with ease. Also, there is nothing remarkable about Marcom, yet. They say they’ll develop the site based on user suggestions. For now, that remains to be seen. MarCom Professional is the first social professional network specifically designed for the marketing communications industry. It’s combines the best of blogging and wiki simply; making it what some pundits call a bliki. The network is pioneering the application of the various Creative Commons licenses to any and all files attached to posts, and there are no virtual fish and no vampire biting a la Facebook; hence the emphasis on professional in “social professional network”! We believe alter egos are important to social professional networking. Some of the famous PR and marketing blogs are renowned for their anonymity, and ultimately members may wish to post polemic and points of view they know may be at odds with their employer’s or client’s position or blogging guidelines. Hopefully that answers your question directly Craig. Sorry you can’t import your blog yet as we only have WordPress and Blogger imports at the moment. We’re working on others, and I think we’ll look at Typepad next. And in answer to your question about nationalities, we have attracted members from the UK, US, Australia and Ireland in just the four days since our official launch. We hope you’ll continue to log in Craig, and we look forward to your making your first post! Have a great weekend.